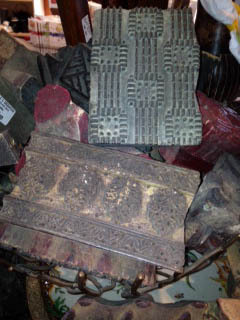 A wonderful old hand carved wooden fabric stamping block from the Himalayas. Traditionally used to stamp the patterns on skirt fabric in Nepal, these wooden blocks have many contemporary uses. Clay, plaster, cement, paper, fabric, candles...the list is limited only by your imagination. The block is individually carved, and as this is an older, used block, it is getting harder and harder to find these cultural icons, as factories become more mechanized replacing hand stamping. Here at Vales Greenhouse we have a collection of different sizes and styles. They make a wonderful gift for the person who loves to decorate as each stamp has a keyhole place in the back so they can be displayed on the wall. A plain brown bird with an effervescent voice, the House Wren is a common backyard bird covering nearly the entire Western Hemisphere. Listen for its rush-and-jumble song in summer and you’ll find this species zipping through shrubs and low tree branches, snatching at insects. House Wrens will gladly use nest boxes, or you may find their twig-filled nests in old cans, boots, or boxes lying around in your garage. This practical and beautifully crafted birdhouse, with the ever-important hole size made to measure for the wren, the birds will quickly move in. A great gift for anyone of any age there will be plenty of time spent watching the comings and goings of this busy bird. The natural rush fibre will provide breathable and water proof snug little house for Wren hatchling and the parents alike. Our pachyderm hooks are perfect for adding a touch of fun to any home decore. The kids love the small size, and really who does not love to have an extra hook just for you. This strong metal elephant as an upturned trunk to create a unsual and fun hanging solution for any interior. This practical hook comes in two sizes and is a great gift for the Elephant Collector, comes with a matching screw, useful decorative accessory for the kitchen, bathroom or hallway. Can be fixed to a door or wall and will hold a variety of things including towels, coats or keys. Keep your frisky kitty cat satisfied with a pillow filled with catnip. Watch your cat as it pounces, attacks and snuggles up with leaves and flowers that are sewn into every pouch to insure the happiness of your feline. Washable pillow covers come in three decorative patterns, so you can keep kitty’s toy clean. This popular and fun toy is sure to become your feline’s favourite.